The place to get up close to one of the world's most majestic mammals – the Southern Right Whale. 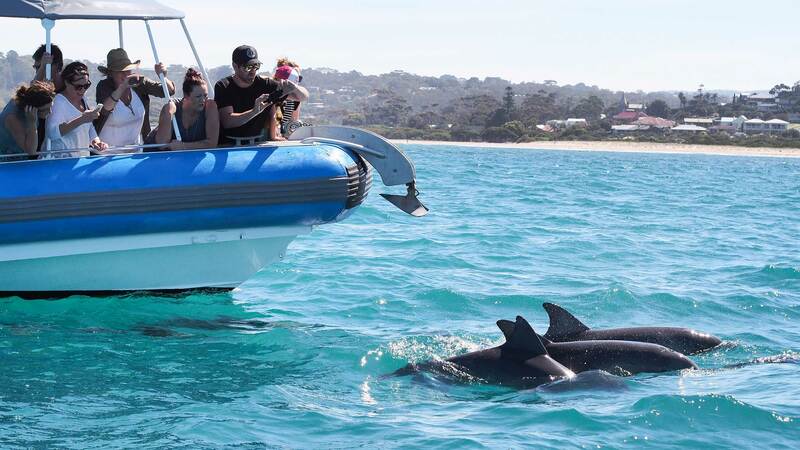 The Fleurieu Peninsula is one of the state's most popular and accessible whale watching regions. With its picturesque coastline, it is the place to get up close to one of the world's most majestic mammals – the Southern Right Whale. 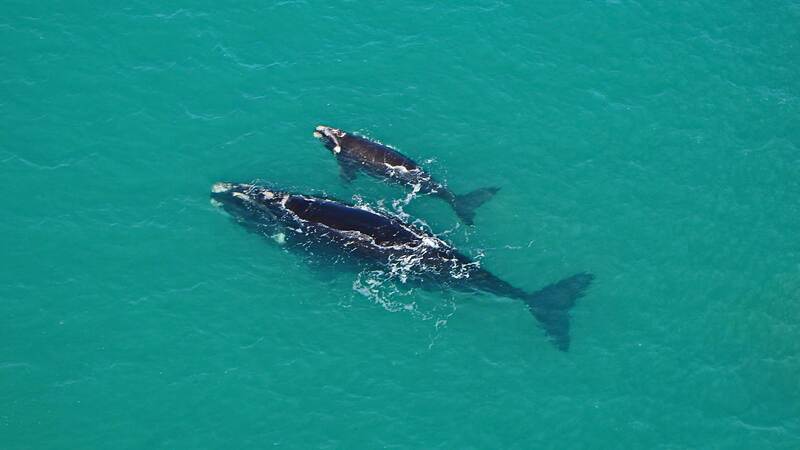 Southern Right Whales, named for being the right whale to hunt, are definitely the right whale to watch. They are slow moving, come very close to shore (often within 30 metres) and can stay in the same area for weeks at a time. With impressive vantage points from Victor Harbor to Goolwa, the chances of seeing a whale during winter are good. More information on whales, sightings and the local marine environment can be found at the South Australian Whale Centre located in Victor Harbor. The Centre hosts an interpretative centre and provides whale watching maps and sighting information to visitors. For more information, visit the SA Whale Centre or call the SA Whale Information Hotline on 1900-WHALES (1900 942 537). 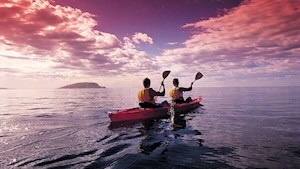 When looking out for whales, keep an eye out for playful dolphins and sea lions. Both the Common dolphin and the Bottlenose dolphin, along with Australian sea lions and fur seals, can often be seen cruising in a peaceful bay, riding the bow wave of a local boat or even dropping in on surfers riding the waves. 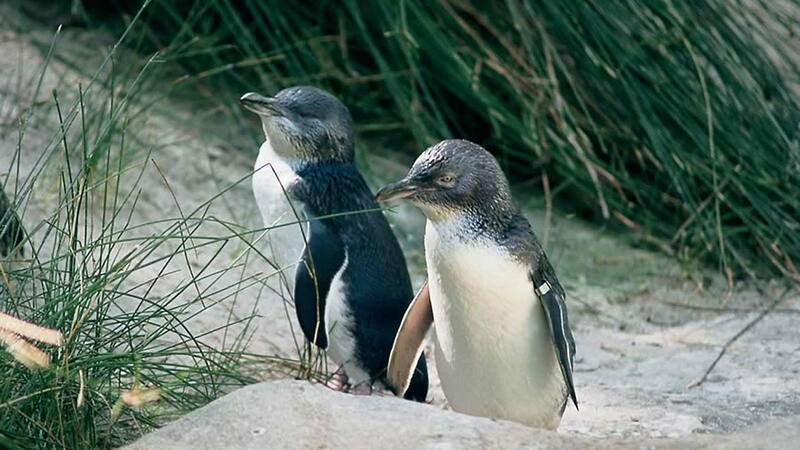 The world's smallest penguin lives in the waters around Victor Harbor and Granite Island and at dusk, after a long day feeding at sea, they retreat to their burrows on the edges of Granite Island, where they live socially in pairs for most of the year. A number of these penguins can also be seen throughout the day in the Penguin Interpretive Centre on Granite Island, where they are permanently housed. 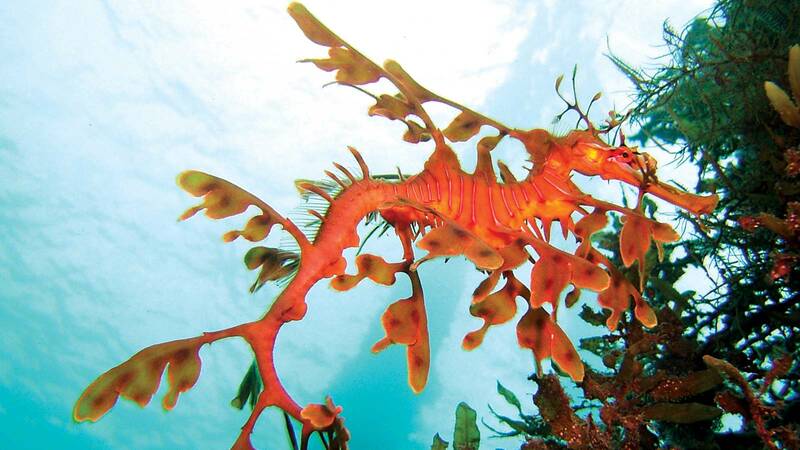 Divers come from all over the world for a face-to-face encounter with the Leafy Sea Dragon. This rare, delicate creature, with the body shape of a sea horse and covered with leaf-like membranes, can only be found in the southern waters of South Australia and Western Australia. Regarded as one of the most spectacular and mysterious of all marine fish, it can best be seen when snokelling or suba diving in the waters near Rapid Bay. Back on land, there's a wealth of wildlife. Some of it's quite shy but not the Western Grey kangaroo that, at certain times of day, can be seen in mobs grazing like sheep in paddocks. 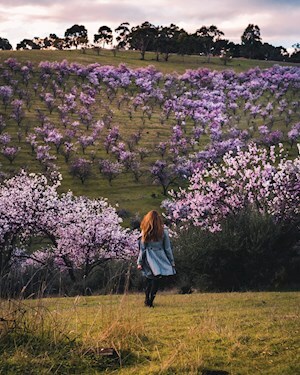 One delightful place where they can be reliably seen is around Tent Hill in Deep Creek Conservation Park, one of the best places on the Peninsula for wildlife. The 4500 hectare park has many less obvious inhabitants also worth seeking out, such as the Short-beaked echidna, Ring-tailed possum and Yellow-footed antechinus. Urimbirra Wildlife Park, near Victor Harbor, is another good place to experience local wildlife. It is home to more than 400 Australian native animals and bird species. The Coorong National Park is famous for its migratory waders and Onkaparinga River Estuary, Aldinga Scrub and areas around Mount Compass, Goolwa, Milang, Strathalbyn and Hindmarsh Island are also rewarding for bird watchers. Located adjacent to Hindmarsh Island, is a hidden gem called Mundoo Island which offers a variety of tours including birdwatching. 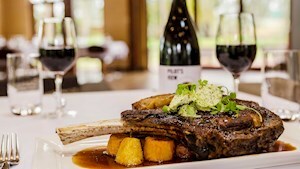 The wetlands and lagoons of the lower Murray River also teem with birdlife, with black swans, egrets and many species of ducks thriving in the shallow waters and river reeds. The Peninsula's national parks house extensive birdlife, with up to 100 species recorded in some of them – many easily spotted when walking. Species of high conservation importance include the Southern Emu wren, Yellow-tailed Black cockatoo, Glossy Black cockatoo, Peregrine falcon, White-bellied Sea eagle, Painted Button quail, Chestnut-rumped heathwren, White's Thrush, Elegant Parrot, Lewin's Rail, Latham's Snipe, Sooty Oyster Catcher and Hooded Plover.